William Hill are known for both their presence on the high-street. 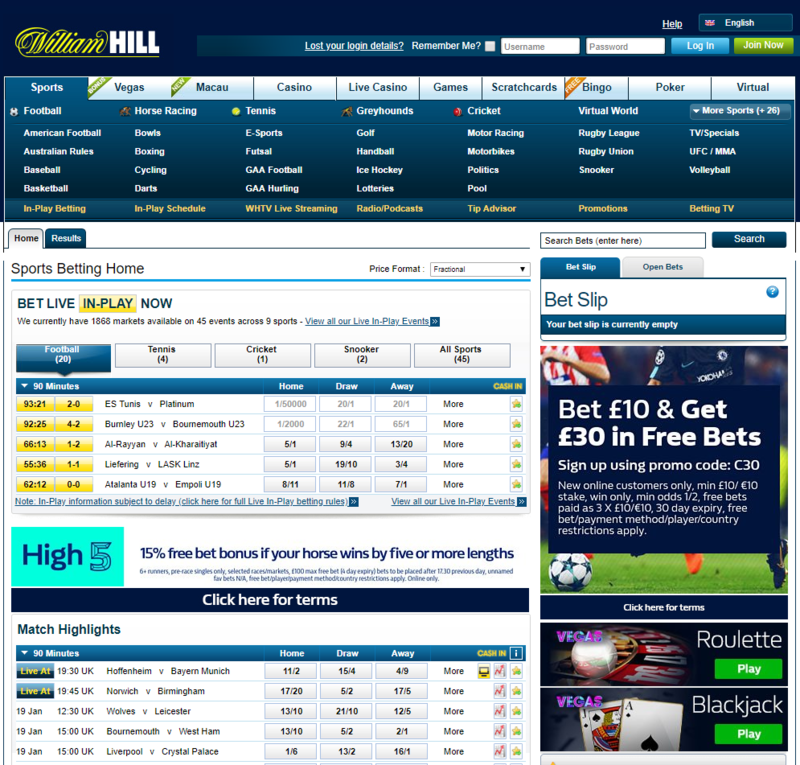 Being founded in 1934, William Hill are known around the world and are one of the largest online and offline bookmaker. They were the first online bookmaker to bring betting on US sports to the UK. We are going to give William Hill an online review. As one of the biggest and first players to the market you would expect William Hill to have a wide range of markets; which they do. A key featured match from the English Premier League will have 264+ markets available. The have every betting market that you will need. William Hill will cover well over 60,000 football matches a year and have all the regular markets in there that you would expect. They have also added a cool feature called #YourOdds. #YourOdds: If offering the regular markets wasn’t enough, William Hill give the punter to create their own markets. Just tweet with your requested bets and they will add them to the markets for you. William Hill’s offer to new customers is extremely generous. Deposit and bet £10 and they will automatically provide you with three £10 Free Bets. This is a great welcome offer to get you playing. You have to make the deposit using a credit or debit card, but the majority of deposits made are using these methods. William Hill are not only focused on getting you playing, they want to keep you playing with ongoing promotions and offers. If a game finished 0-0 they will refund your stake. They also offer an ACCUMULATOR INURANCE is offer with William Hill on accumulators over 5 selections. Check out our ACCULUMLATOR INSURANCE LIST to see which online bookie is best for you! Betting in-play couldn’t be easier than with William Hill. You have the options of mobile, app or desktop to place your in-play bets. They will enhance particular markets and offers during games to entice you to bet. They will cover pretty much every single professional football game with in-play markets and offers. With all the in-play markets, offers and enhanced options, William Hill have added Live Streaming and Cash Out to complete the site. The ease of use when placing the bets is what makes William Hill a great place to put your bets. ‘Cash In My Bet’ allows punters to see the value of their bet before the cash it out and cash it out to the value that they’re happy with. It means if you see that one of your selections is looking a little bit doggy you can cash in before the final whistle. If it’s an Online Casino you are after check out our Casino Review Page. There are more than enough banking solutions for those who are based in the UK. When transferring to the account it is instant. Withdrawing from your account can take 3-5 working days. Using E-WALLETS can be useful for instant access and also for security.